Mamta's Kitchen » Self Raising Flour, How to make it? Self Raising Flour, How to make it? What is Self Raising or SR flour? As the name implies it is a flour which already contains the agents needed to produce a rise during cooking. These raising agents have the same action as adding baking powder to plain flour at home. One of these chemical raising agents is alkaline and the other is acidic and when a water based liquid is added they react to form a gas called carbon dioxide (CO2). The CO2 bubbles expand during heating and cause the cake batter/dough to rise. The alkaline agent (chemical) added to flour, and put into baking powder, is usually sodium bicarbonate but the acidic agent (chemical) can vary from product to product. The most commonly used acidic agent (chemical) in baking powder used to be tartaric acid (Cream of Tartar), but although this is still sold separately for home cooking, it is less often used in baking powder or SR flour. Salts of phosphoric acid (phosphates), containing calcium or aluminium, are often used as the acidic reagent. Sodium bicarbonate is also sold separately as Bicarbonate of Soda or Baking Soda, for use in recipes where extra raising is needed, where acid ingredients need to be neutralised, or where there are already acidic ingredients to activate the CO2 production. As it is just the alkaline agent, do not confuse it with Baking Powder, or try to use Baking Powder as a substitute. Self raising flour is useful because it saves having to measure out different raising agents each time you bake, but there are some occasions when it does not supply enough raising power, so more has to be added. Be guided by your recipe, and if extra Baking Powder or Bicarbonate of Soda is added, do not leave it out. Also if a recipe uses plain flour and a raising agent, or a mixture of plain and SR flour, it is because SR flour alone would supply too much raising power. About salt: Amount of salt is a thorny issue. It is only added to cakes to enhance and balance the other flavours - rather like seasoning a savoury dish. There is some talk of it interacting with the raising agents and perhaps giving a slightly better rise, and keeping egg white more stable when whipped, before folding into a cake batter, but those are minor points. I think it's only in the USA that salt is routinely added to flour, so if you are following UK recipes, which often add a little salt to recipes, or use salted butter, then I don't think you need to add any salt if mixing your own SR flour. It would be perfectly acceptable to leave salt out of baking recipes altogether, if salt intake is an issue - but the flavours of fairly plain cakes may seem a little 'flatter'. If the cake has plenty of flavouring, then the absence of salt probably won't be noticed. To make your own SR flour, use any one of the following combinations, noting carefully whether the measure is a teaspoon (tsp.) or tablespoon (tbsp.) or dessert spoon (dsp.). Reduce the amount of salt if you want lower salt content, see notes above. All spoon measures are level spoons and measure as follows; 1 tsp.5 ml. 1 dsp.=10 ml. 1 tbsp. 15 ml. Sift all the ingredients together 3-4 times in a bowl, to make an even mix. Sifting also traps air in the flour and makes it lighter. To make baking powder, place 3 tsp. bicarbonate of soda and 4 tsp. cream of tartar in a jar and shake them well together. Store it in an airtight container in cool place. These are collection of SR flour recipes from books and internet sites. The quantities above are only a rough guide. 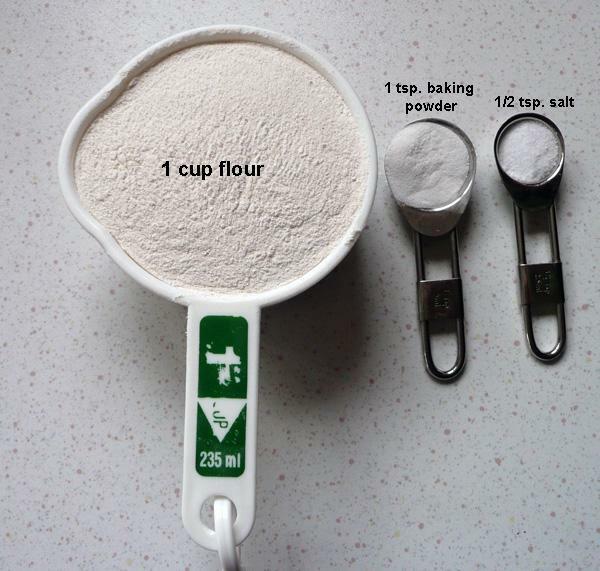 The amount of baking powder can vary according to a recipe and what else you have added to it. For example, 1 1/2 to 2 level tsp. baking powder is generally enough when using 250 gm. flour and 120 gm. fat. But if you increase the amount of fat and also add eggs, which all help to make it rise, you only need 1 to 1 1/2 tsp. baking powder. So, follow the recipe closely.